Egypt. Land of the Pyramids and a vast collection of evidence that, like a taciturn teenager, is begging for understanding. Contrary to conventional thought, for decades there has been an undercurrent of speculation that the pyramid builders were more advanced. The speculation is well placed. When attempts have been made to build pyramids using the theorized methods of the ancient Egyptians, they have fallen considerably short. 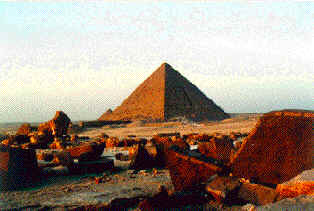 The great pyramid is 483 feet high and houses 70 ton pieces of granite lifted to a level of 175 feet. Theorists have struggled with stones weighing up to 2 tons to a height of a few feet. One wonders if these were attempts to prove that primitive methods are capable of building the Egyptian pyramids or the opposite? Executing this theory to practice has not revealed the theory to be correct. Do we need to revise the theory, or will we continue to educate our young with erroneous data? In August, 1984, I had an article published in Analog magazine entitled "Advanced Machining in Ancient Egypt?" It was a study of "Pyramids and Temples of Gizeh," the work of Sir. William Flinders Petrie. Since the articles publication, I have been fortunate to visit Egypt twice. With each visit I leave with more respect for the industry of the ancient pyramid builders. An industry, by the way, that does not exist today. While in Egypt in 1986, I visited the Cairo museum and gave a copy of my article, along with a business card, to the director of the museum. He thanked me kindly, threw it in a drawer to join other sundry material, and turned away. Another Egyptologist led me to the "tool room" to educate me in the methods of the ancient masons by showing me a few cases that housed primitive copper tools. I asked my host about the cutting of granite, for this was the focus of my article. He explained how they cut a slot in the granite and inserted wooden wedges which they soaked with water. The wood swelled creating pressure that split the rock. Splitting rock is vastly different than machining it and this did not explain how copper implements were able to cut granite, but he was so enthusiastic with his dissertation, I did not wish to interrupt. The Aswan quarries were educational. The obelisk weighs approximately 3,000 tons. However, the quarry marks I saw there did not satisfy me as being the only means by which the pyramid builders quarried their rock. Located in the channel, which runs the length of the obelisk, is a large round hole drilled into the bedrock hillside, measuring approximately 12 inches in diameter and 3 feet deep. 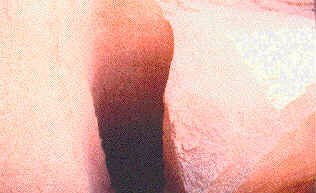 The hole was drilled at an angle with the top intruding into the channel space. The ancients may have used drills to remove material from the perimeter of the obelisk, knocked out the webs between the holes and then removed the cusps. While strolling around the Giza Plateau later in the week, I started to question the quarry marks at Aswan even more. (I also questioned why the Egyptologist had deemed it necessary to buy an airplane ticket to look at them.) I was to the South of the second pyramid when I found an abundance of quarry marks of similar nature. The granite casing stones which had sheathed the second pyramid were stripped off and lying around the base in various stages of destruction. 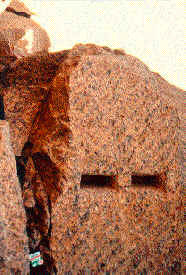 Typical to all of the granite stones worked on were the same quarry marks that I had seen at Aswan earlier in the week. This was puzzling to me. Disregarding the impossibility of Egyptologists theories on the ancient pyramid builders quarrying methods, are they really valid from a non-technical, logical viewpoint? If these quarry marks distinctively identify the people who created the pyramids, why would they engage in such a tremendous amount of extremely difficult work only to destroy their work after having completed it? It seems to me that these kinds of quarry marks were from a later period of time and were created by people who were interested only in obtaining granite, without caring from where they got it. Archeology is largely the study of historys toolmakers. It is with tools and artifacts created with tools, that we come to understand a societys level of advancement. The hammer is probably the first tool ever invented, and by hammer working metals, relatively unsophisticated tools have forged some elegant and most beautiful artifacts. Ever since man first learned that he could effect profound changes in his environment by applying force with a reasonable degree of accuracy, the development of tools has been a continuous and fascinating aspect of human endeavor. The Great Pyramid leads a long list of artifacts that have been incredibly misunderstood and misinterpreted by Egyptologists. They have postulated theories and methods based on a collection of tools that are, at best, questionable. For the most part, primitive tools that have been uncovered would be considered contempor-aneous with the artifacts of the same period. This period in Egyptian history, however, resulted in artifacts being produced in prolific number with no tools surviving to explain their creation. The ancient Egyptians left artifacts behind that are unexplainable in simple terms. The tools that have been uncovered do not fully represent the "state-of-the-art" that is physically evident in these artifacts. There are some intriguing objects surviving this civilization which, despite its most visible and impressive monuments, has left us with only a sketchy understanding of its full experience on planet Earth. We would be hard pressed to produce many of these artifacts today, even using our advanced methods of manufacturing. The tools displayed as instruments for the creation of these incredible artifacts are physically incapable of reproducing many of the artifacts in question. Along with the enormous task of quarrying, cutting and erecting the Great Pyramid and its neighbors, thousands of tons of hard igneous rock, such as granite and diorite, were carved with extreme proficiency and accuracy. After standing in awe before these engineering marvels and then being shown a paltry collection of copper implements in the tool case at the Cairo Museum, one comes away with a sense of frustration, futility and wonder.